I’m a big fan of using video to learn language. “If I only had a dollar for every person who told me they learned English by watching Friends!” Extensive watching works, it really does. Educational video works but it is too often dull, dim, uncompelling, lacking narrative and just plain awful to watch. 99% of what gets created fits this mold. However, I think Fortune is something different and breaks that mold. That’s refreshing. 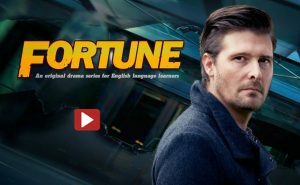 Fortune is a ground-breaking online “Netflix” style series specifically designed for English language learners. The series follows the story of private investigator Jimmy Fortune whose wife Jenny has been kidnapped. Students will be captivated by the action and easy to understand storyline and language. The show’s creators, Ben Woollen and Scott Granville from Chasing Time English, set out to create a new experience for English language learners who too often studying dry, too educational, non-narrative based content. Fortune represents video that keeps the focus on engaging, emotional, video based language learning content that students really WANT to watch and learn with. Video shouldn’t be only dry study material but compelling and of high interest to students. There are teacher materials for the series available on their website. I wish the creators well and look forward to additional episodes and programs. A great start. So, get started by watching Episode 1 and tell us what you think! View all episodes here on Youtube.